In the week leading up to the brazen, cold-blooded murder of Russian Ambassador Andrei Karlov in Ankara, Turkey, the United States repeatedly and publicly threatened “retaliation” against Russia for allegedly “hacking” the 2016 US presidential elections. During the same week, Syrian forces backed by Russian airpower and Iranian ground support, finally ended the occupation of the northern city of Aleppo by armed militants who invaded in 2012. The inevitable liberation of Aleppo was accompanied by apoplectic hysteria across Western political, policy and pundit circles calling for everything from additional sanctions on Russia to threats against the lives of Russians themselves. 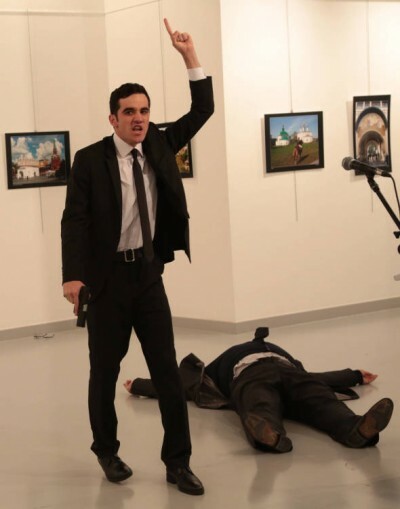 While the Western media has since attempted to dismiss murmurs across Russian and Turkish media in the aftermath of Ambassador Karlov’s assassination implicating US involvement, they simultaneously appear incapable of concealing what can only be described as delight over the tragic attack. The shooting was among the most brazen retaliatory attacks yet on Russia since Moscow entered the war in Syria on the side of President Bashar al-Assad, and unleashed a bombardment on Aleppo that has drawn international condemnation for what observers on the ground have called indiscriminate attacks on civilians. The Washington Post is able to refrain from openly applauding the assassination, but does everything in its power to legitimize, even defend it within the context of an angry “police officer” provoked by what the Washington Post calls Russia’s “indiscriminate attacks on civilians.” Relegated deep within the article and beyond the attention span of most readers, are details that reveal Ambassador Karlov’s attacker as a participant in organized terror. CNN, the BBC and the New York Times have also carried, almost verbatim, the same talking points and perspectives provided by the Washington Post, just falling short of openly defending the attack or praising the attacker. The Western media does not perform “journalism,” but rather reflects the thinking and designs of Western policymakers, politicians and power brokers. That the media appears unanimously spinning the attack as “retaliatory,” after spending the last week promising “retaliation” is if nothing else the worst case of institutional self-incrimination in recent memory. More likely, it is a blunt, ugly gesture toward Russia. Unfortunately for the West, they find themselves threatening the world and celebrating the murder of ambassadors shot in the back by terrorists not from a position of strength, but from a position of profound and growing weakness. It is a vicious cycle that will only further undermine their legitimacy, diminish their influence and accelerate their decline.